I had no idea I went the entire month of February without posting a recipe. However, this recipe is so easy and delicious, it makes up for my terrible lapse. This is my mom's Beef Stroganoff. Mix the three soups together in a mixing bowl. Add stew meat (you can brown the beef cubes first but you don't have to). Bake in oven on 250 for 8 hours, or in a Crock Pot on low for 8 hours, until the meat is fork tender. Make noodles or rice according to package directions. Pour meat and gravy on top. Your husband and kids will love you - this makes the best meat and gravy! I especially love this recipe because I can put the meat on to cook while I'm at work, and when I get home all I have to do is make noodles or rice and dinner is on the table in record time. Yummy I haven't made that in years! Awesome I know whats for dinner tonight! Frau - It is so good no one would guess it's a "soup can" recipe! Once upon a time I had a Campbell's cook book and it had a recipe very similar to this in it. I love beef stroganoff. I used to make this when I worked - then stir a little sour cream in at the end. Always made me happy. Thanks for posting the recipe because I had lost it somewhere along the way. 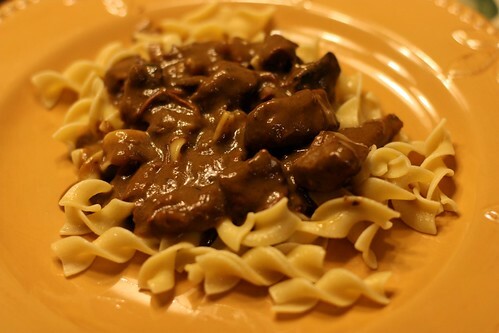 I have been looking for a super easy stroganoff. Thank you sooo much for sharing! I cannot wait to try it! I'm always looking for a good stroganoff recipe. Thanks for posting this! I am so excited! As I "push" fifty, I'm finding more things I want to learn how to do, and cooking is at the top of the list. While many people (read: food snobs) would scoff at this recipe, I can't wait to try it. This looks like a fantastic recipe--love having something new! I am making it Friday night (obviously I'm not a Catholic, though stating I am eating meat on a Friday during lent gave this former Catholic pause), and am looking forward to it. Seriously a novice, I was happy even to be able to locate the beef in the meat dept. when I shopped last night! My meat consumption has been drastically cut back, so this is literally making my mouth water!